DSV has long been one of the logistics sector’s most impressive performers and this did not change in 2017, with the company demonstrating both organic growth and the successful integration of UTi. DSV’s forwarding business appears to have had a remarkably good year. Volumes increased respectably, with sea freight rising by 6.4% and air freight by 10.6% for the year, yet gross profit (revenue minus cost of services purchased) rose only 3.4% with currency effects combining with hardening freight rates to squeeze gross margins. Despite this, the forwarding division delivered an increase in EBIT of 50.5% to DKK3,225m before currency effects and exceptional items. The situation in the contract logistics ‘Solutions’ business was similar. Revenue climbed by 17.5% but EBIT jumped 28.6% to hit DKK494m. Although gross margin softened, operating profit margin hardened from 4% to 4.3% over 2017. Even road freight did reasonably well. ‘Shipments’ grew by 6%, faster than the market, but gross profit grew only 3.8%, although this was depressed by currency effects. However, EBIT jumped by 14.5% to DKK1,201m. 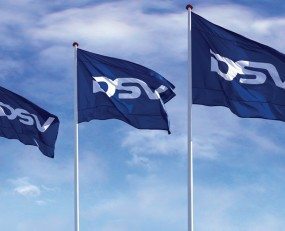 Overall, DSV saw gross profit for the year increase 6% to DKK16,605m whilst EBIT rose by 43% to DKK4,878m. 2017’s results reflected both the purchase of UTi and organic strength, as growing profit margins illustrated. Having illustrated their efficiency at integration the logical next step for DSV is further acquisitions, something that the company’s Chief Financial Officer, Jens Lund, confirmed. He commented that any purchase would preferably be in air and sea forwarding and be a deal greater than US$1bn.